Greecetopia: My Cheat Sheet on What to Pack, Where To Stay and Where To Eat in Santorini and Mykonos! 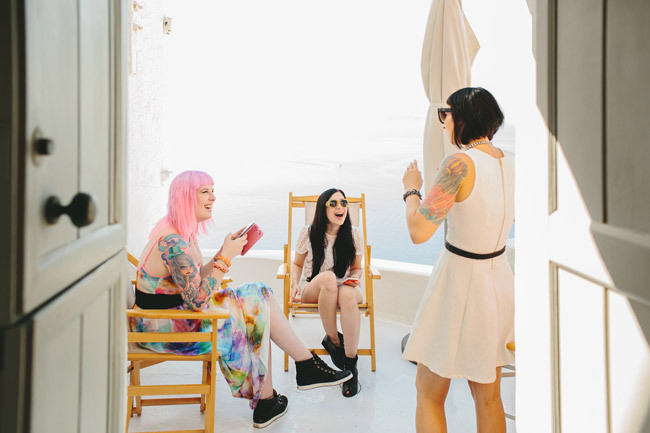 Over the summer, I visited two of the most iconic Greek islands, Santorini and Mykonos with Kat and Gala. During the week I split between the two, I took notes on some travel basics that will hopefully be helpful if you’re planning a trip! 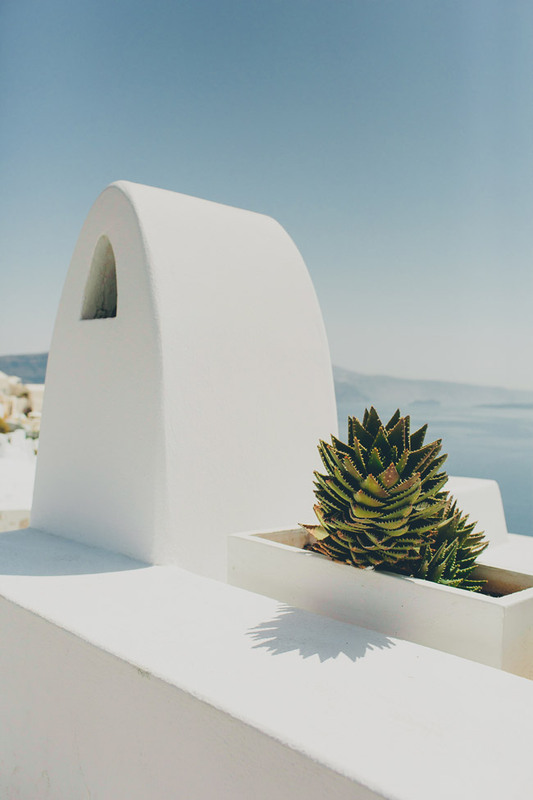 • Since both Santorini and Mykonos rely heavily on tourism, everyone we interacted with at restaurants, on boats and in taxis spoke at least basic English. We had no trouble at all getting directions, ordering or booking tickets. • Both islands are on the Euro. If you do need cash, there are ATMs but they’re few and far between. At one point, I had to use one from Alpha Bank that was mostly in Greek. That was fun! • All the shops and restaurants we visited, no matter how small, accepted credit cards. • You can’t drink tap water on either island! When you sit down at a restaurant, they automatically bring you bottled water. And grocery stores everywhere sell it for dirt cheap. • Wifi can be very spotty. Most restaurants do advertise free wifi on their outside menus but still, it was pretty hit or miss at half of the places we dined at. Depending on how you look at it, this can either be a blessing or a curse! Our villa in Santorini had a super weak signal and we quickly realized that we could only upload images on Instagram at around 5 am. Every morning, I would roll out of bed in the darkness, walk out to our front steps, hold my phone to the heavens and hope for the best! On the flip side, our luxury hotel in Mykonos had blazing fast internet. • The one thing you’re not told until you arrive is that you can’t flush toilet paper. At all. If you’re staying in a luxury hotel, that’s one story but at villas and regular places, don’t even try. As you can imagine, the pipes snaking through the islands are quite old and this leaves you with only one option. There’s a garbage can next to most toilets and after you wipe, you drop it in. Yep. Honestly, it takes some time to get used to but it’s just part of the deal. As a side note, our handsome villa host in Santorini, Nicholas came by nearly every day to collect our…trash. He was so gracious about it that it wasn’t even a big deal! • A wide-brimmed hat is a must, especially if you’re taking a boat tour. Pack one that easily rolls up. • Sunglasses are a must as well, though if you forget yours, there are plenty of shops on both islands that sell them. Expect to pay a premium, though! • Roll up an extra tote bag in your suitcase in case packing woes strike! When we went to catch our Easyjet flight back to London, Kat’s luggage was over the weight limit but we were able to save on outrageous overage fees by loading one up with her extra belongings. • Bring more than one swimsuit. There are plenty of opportunities to swim, from hotel pools to the Aegean Sea (many of the boat tours let you hop off and swim). Nobody wants to slither into a wet swimsuit so keep two on rotation. • Flat sandals or shoes are necessary. 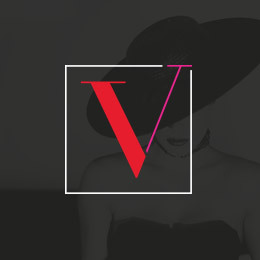 Absolutely DO NOT pack heels, unless you’re spending the entire time prancing around a luxury hotel or clubbing. There are hundreds of uneven stone steps everywhere and a lot of them curve along the side of steep mountains. I brought some low-heeled leather lace-up sandals with ankle support that I ended up wearing nearly every day. Remember, the islands are full of tourists and there’s nobody to impress! • Stick with lightly colored cotton or linen layers. The heat during the day can be unrelenting. I packed mostly sundresses, wrap skirts and plain t-shirts and tanks. Both islands are extremely casual. • Since we were flying from London to Santorini, Easyjet was the best choice. Flights are cheap and direct. The whole process was completely painless. Just make sure you have your boarding passes printed in advance and follow the strict weight guidelines for packing, otherwise you’ll get gouged! • We had a taxi arranged for us by our Air bnb hosts (most will set up any cars and tickets you may need) but if you google “santorini taxi” there are quite a few companies that can hook you up. 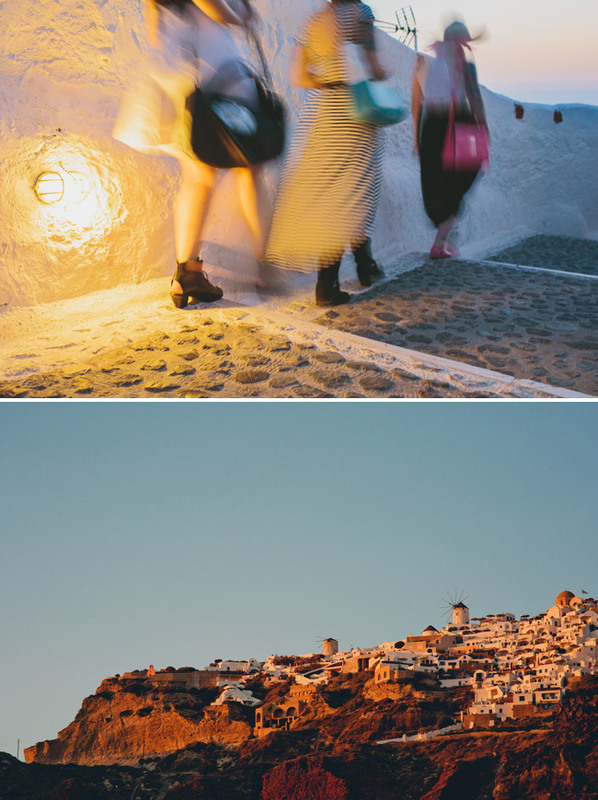 • The roads throughout both Santorini and Mykonos are windy, steep, ridiculously narrow and more than a little scary. Tourists on scooters and 4-wheelers will cut you off. People stroll into the street. Yet, our drivers expertly zoomed around them with barely a second glance! Amazing. 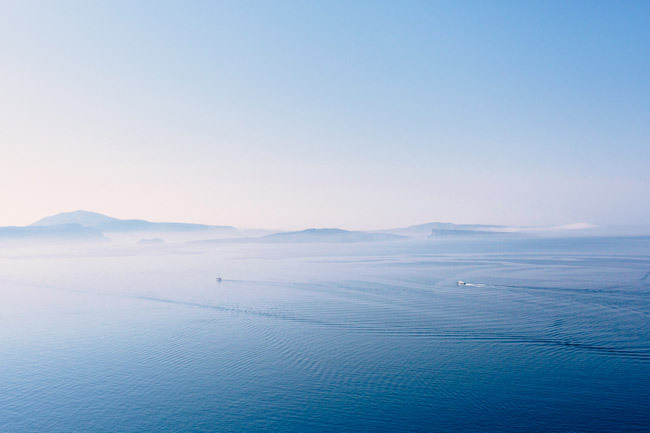 • To travel between Santorini and Mykonos, we used a boat company called Sea Jets. It’s about 3 hours by boat between the two islands and the most affordable way to island hop. 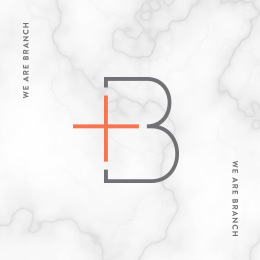 At every restaurant we dined at, it didn’t matter whether we were ordering breakfast, lunch or dinner — a bread basket and butter automatically arrived. Starting off three square meals a day with a pile of bread was fine by me since I was on vacation but if you’re on a diet, be prepared! When you’re on an island, everything that’s note raised or grown has to be shipped in so we definitely noticed that the food choices were limited. Everything was delicious but most restaurants had very similar menus. The menus went something like this: 10 pasta dishes, 10 meat dishes, 10 appetizers, 5 salads and a whole lot of wine! Interestingly, most of the salads we ordered came with an ENTIRE block of feta placed on top. It was pretty intense. I’ve never eaten that much cheese at once in my entire life! Another day, another salad…and another block of cheese! On Santorini, we loved our dinners at King Neptune, which has been around since the 1950s. It had one of the largest menus on the island we’d seen (our table went crazy for the zucchini balls) and beautiful views. There are grocery stores for when you just need a snack. We overdosed on chocolate, thanks to ever-present canisters of Caprice Wafers. Five cans later, we were still jonesin’ for our next fix. It’s a downward spiral, I tell you. I also LOVED the Greek version of Oreos. For Mykonos, after a few sub-par meals, we mostly stuck around our digs at the Grace Mykonos which served food on par with a five star restaurant the entire time. Even better, they made us breakfasts on request with anything we could dream up and it was all included with the room. Being served poolside every morning was pretty amazing. Did I mention that there were bottomless mimosas, too?! Gala is a research junkie and picked out two completely opposite yet equally amazing spots for our stay. 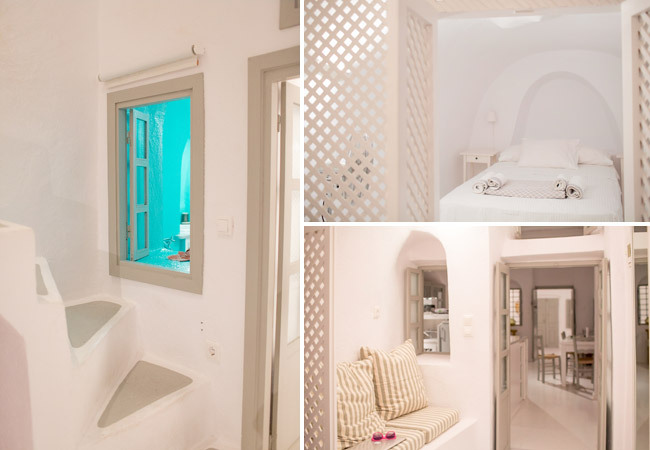 Santorini is known for its beautiful white buildings that cover the mountainsides so we chose the Marble Sun Villa in Oia which had jaw-dropping views of the Aegean Sea. The place was white-walled and spotless with tons of space. The four of us were completely comfortable — we could have easily been a group of six and been fine. Our villa was about 30 steps from the shops and restaurants and definitely forced us to burn off all the bread, chocolate and cheese we ate! 30 steps is A LOT though when you’re lugging around insanely heavy suitcases! Luckily, our porter Versilius hauled them at record speed for us. What a guy! The best part of staying at Marble Sun was our private balcony — we spent most nights there, listening to terrible music, drinking wine, eating entire canisters of Caprices and laughing until we cried! Waking up to this view every morning and watching the sun rise is something I’ll never forget. For our stay in Mykonos, we booked the Grace Mykonos which has the most impeccable service I’ve ever witnessed. The staff is amazing — we quickly befriended our hostess Christina, who gave us ample free shots poolside! Our bartender, Dijan was was full of the most entertaining stories and mixed some of the best drinks I’ve ever had. If you want a truly relaxing vacation and to be completely waited on, this is your place. It was so awesome that we barely left the pool for three days! 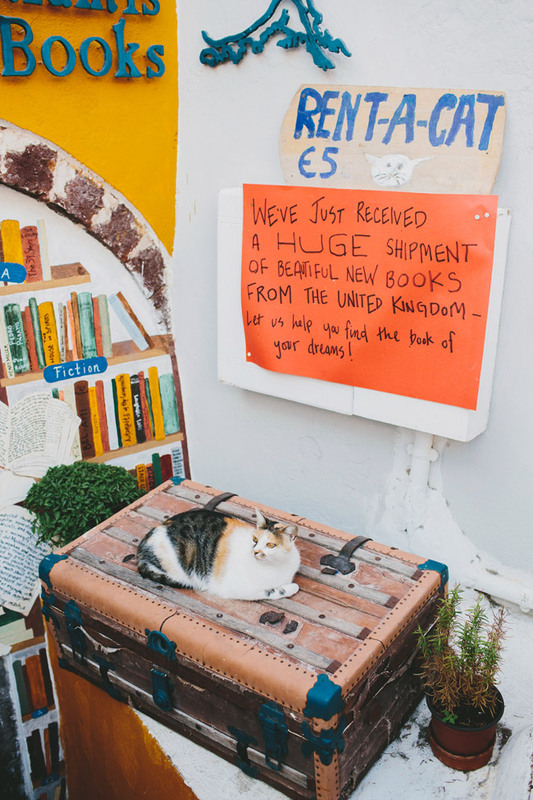 • One of our favorite shops ended up being an independent bookstore in Santorini called Atlantis Books…which rented cats as well! • Both islands are full of maze-like paths of shops. After awhile, it feels like each shop sells similar things but it’s still super fun to explore since they seem to go on forever. We bought piles of questionable items including a beach towel emblazoned with a donkey and a bottle of Greek Superiority. 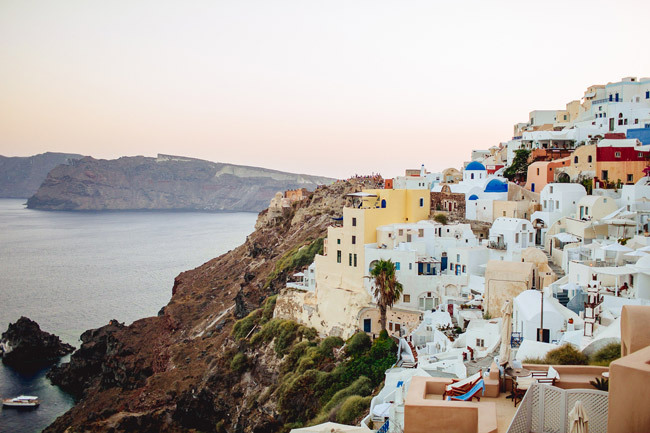 • If you’re staying on Santorini, the sunsets in Oia are legendary. 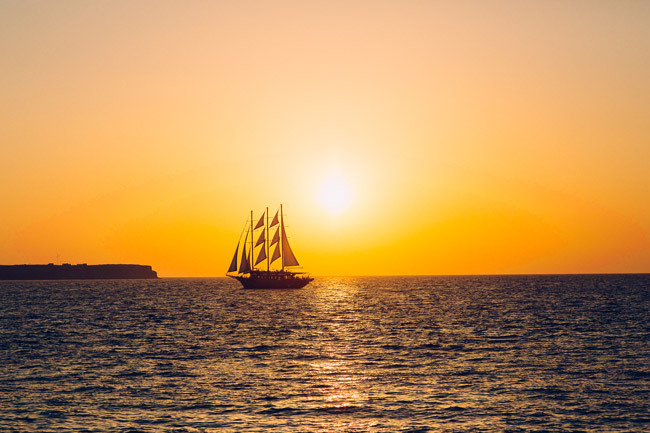 • The most fun we had during our entire time in Santorini was taking a five hour sailboat tour around the island that concluded with watching the sunset. There are dozens of companies that offer a variety of options including fancy dinners on catamarans but we kept things simple and did a 25 euro trip. Since we were staying in Oia, it was a bit of a trek to the boat which was docked on the other side of the island at the Old Port in Fira but a travel agent (there’s a row of them in the center of town) can direct you on what to do and where to go. • To get to Old Port for your boat tour, a very, very steep cable car ride down the side of the mountain takes place. 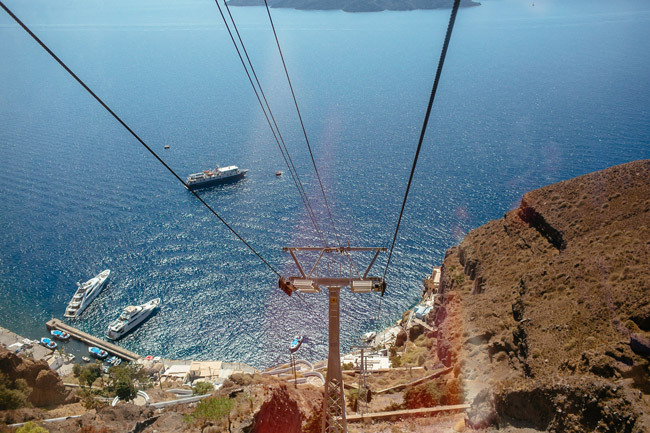 Well, you can actually choose between the cable car…or a donkey ride! • In Mykonos, there are many beachside clubs and it’s known as the place to party in the Greek Islands. Honestly though, we had a great time spending our nights relaxing poolside at the Grace Mykonos bar so I can’t give any firsthand advice in that department! • For most of our island days, we were just happy weaving through the streets, peeking into stores and snapping hundreds of photos. Both islands are so beautiful that there’s a photo opp around every corner. Well, that concludes my Greecetopia recap! Let me know if you have any questions. Even as recently as a year ago, I never imagined that I would be visiting Santorini or Mykonos but now I can honestly say that they’ve been the highlight of all my travels. All photos: Shell de Mar. More photos and fun: The Week in Pictures Santorini and The Week in Pictures Mykonos. 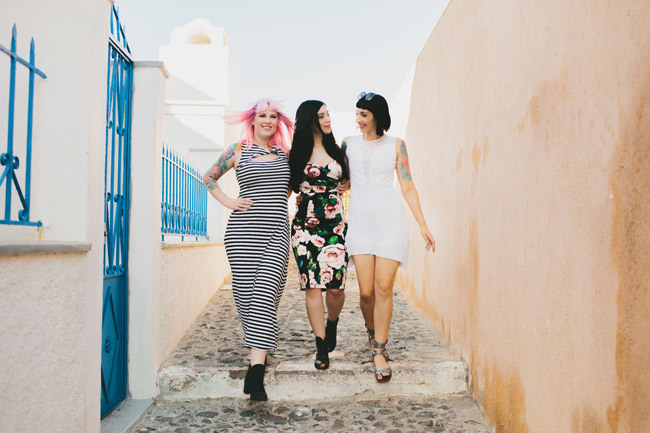 Videos of our island adventures: Easy Breezy Santorini and Oh, Mykonos. 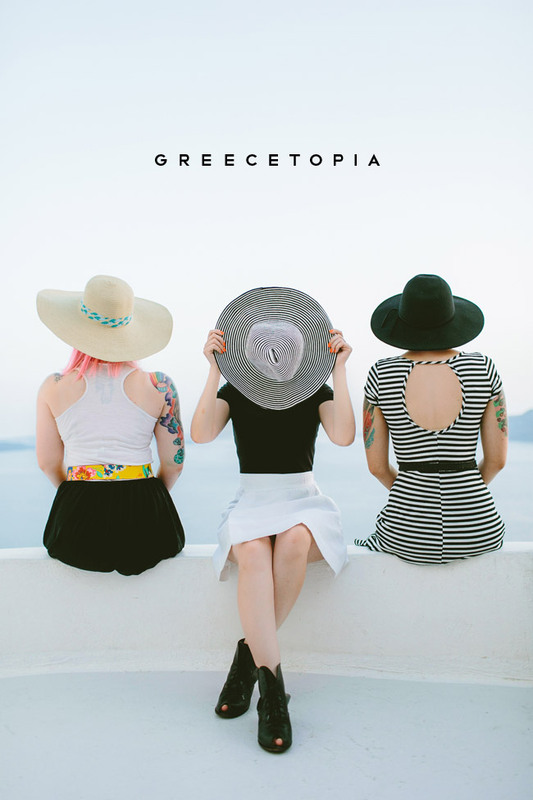 35 Responses to Greecetopia: My Cheat Sheet on What to Pack, Where To Stay and Where To Eat in Santorini and Mykonos! 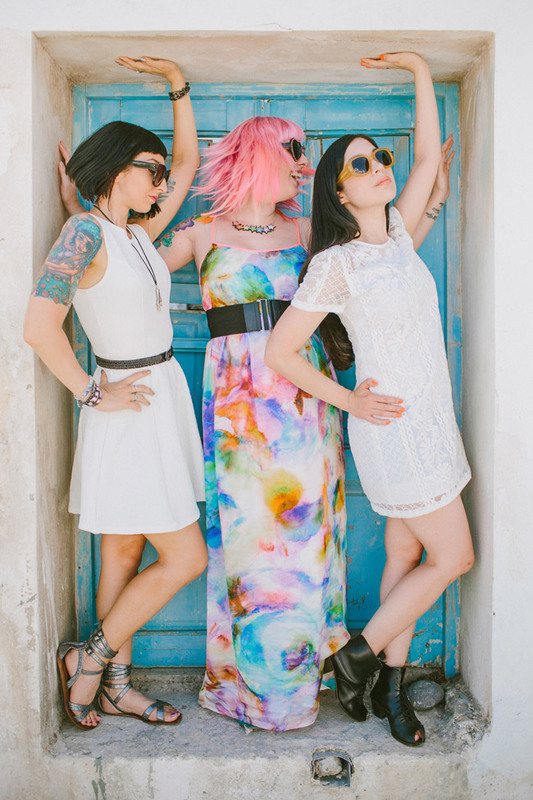 You guys are so beautiful and color among the white walls! Lovely pictures and tips! Ahh LOVE this post. Take me back there! Awesome post! Thank you so much for sharing. Love the images!! I can’t wait to visit Greece someday – Looks fabulous! The photographs here are beautiful! I am so glad you three had so much fun, you definitely deserved it:) Ahhh! It’s so so so beautiful! Wonderful information! 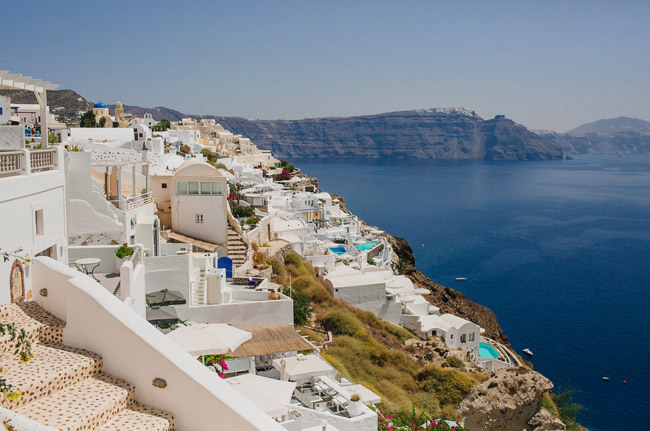 We’re planning our honeymoon to Greece right now, and this guide is EXACTLY what I was looking for! Thank you! Angela: Awesome. I am so glad you found it helpful! Loved your pics, and information. We are going in the winter months and I was wondering what to pack for the weather? your pictures are beautiful! I am going to Santorini for 3 nights and was wondering where to stay? I heard Oia is beautiful but how far is it from beaches? Amazing tips!! I’m heading to Greece in September and you’ve got me even more excited than before. I’ll be there this month too! I get there on the 11th. Always love meetings elbow travelers on my trips!! 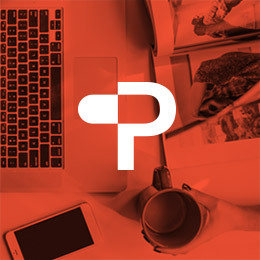 ..i loved stumbling across your cheat sheet, browsing through your holiday photos and reading the holiday information you’ve shared – its to the T exactly how it is, I couldn’t agree more! 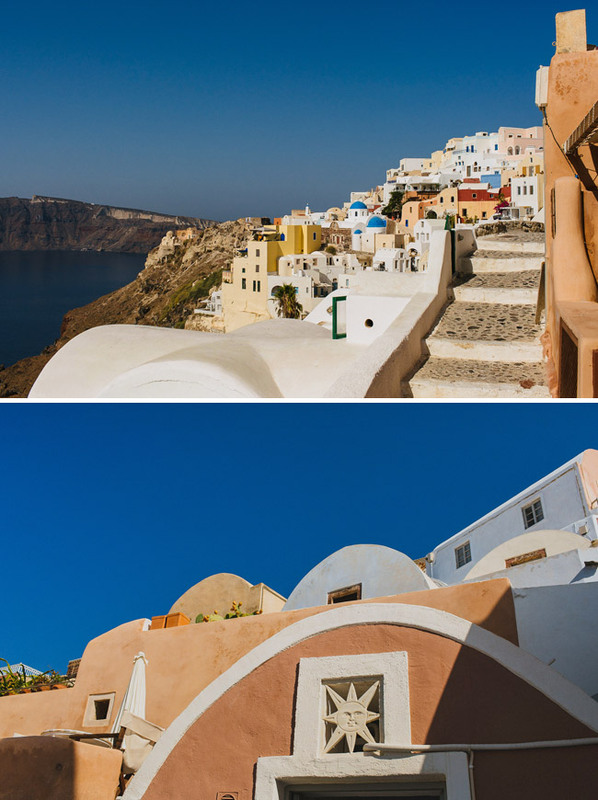 Which would you recommend first Santorini or Mykonos ? So gorgeous! Wonderful post. I will definitely be looking into these options for my trip to Greece in a month! 27th Anniversary Tuesday so………hey gotta have some fun right? I am planning trip to Athens and Mykonos in february, I know its winters in Feb.
Should I cancel my trip, i not then what all should i keep in mind. I will be traveling alone. are there any things that I need to be aware of as a solo female traveler? I came across your article while doing some research on Greece. My two girlfriends and I are going in September. Not only was your cheat sheet informative, It has definitely psyched me up that much more! Your pictures are awesome. Can’t wait to experience it myself. What dates are u going?! I’m going solo and would love to meet fellow travelers!!! I’m landing in Athens on the 11th! Did you have a photographer following you around or how did you get these awesome shots?!? I’m going solo this week for my birthday and I want some awesome photos so let me know your secret!!! yay! this was so so helpful. 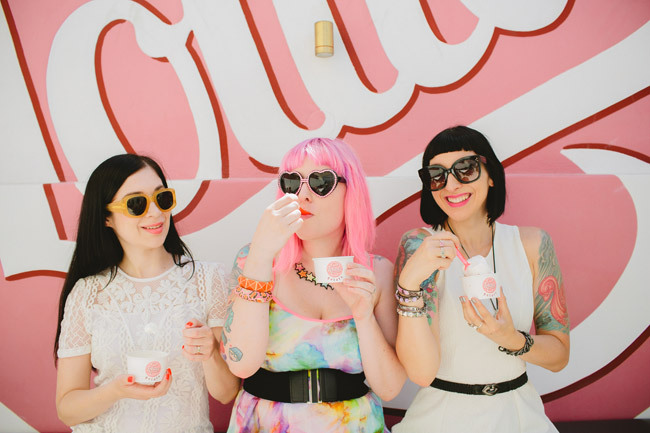 The best round up post I’ve read, and am so excited to hit a bunch of these spots! thanks for sharing!! What company provided your boat trip? Thanks so much. I am going to Greece in April and your suggestions RealAudio help. very helpful thank you….cant wait to go end of June…. its looks amazing and just what we need!!! Thanks for sharing. Awesome photos! I am visiting Greece in two weeks I cannot wait! We will be in Mykonos & Santorini in September 2018, is the weather still hot during September?